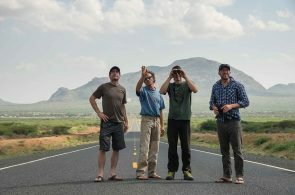 Alex Honnold, Cedar Wright and Maury Birdwell venture out on a “no holds barred” adventure to the wilds of Kenya. Cedar Wright scouts for new route potential on the Mouse formation in northern Kenya. 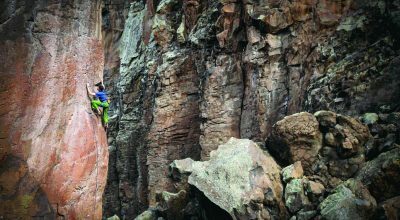 Earlier in the trip, after a few days of work, he and Maury Birdwell established a five-pitch 5.12+ line directly up the overhanging Cat formation, seen in the background. While Wright and Maury were working the Cat, Alex Honnold put up a techie 60-meter 5.12b arête climb on the Mouse. 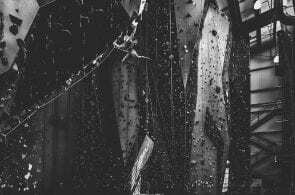 Hyenas howled most nights, and a lion walked through camp one evening while we slept. We were, as they say in east Africa, deep in the bush bush. 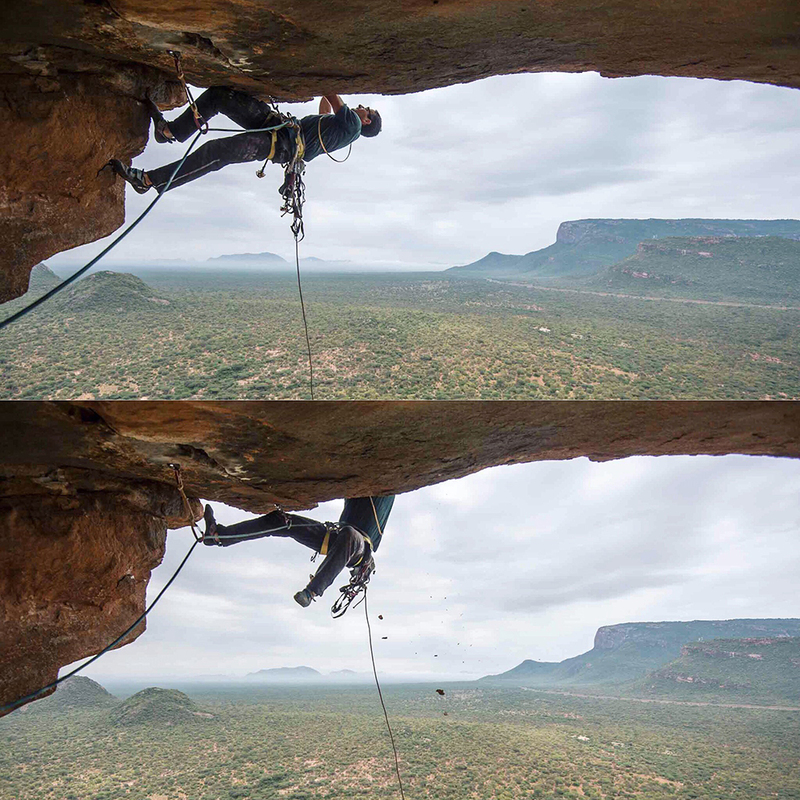 The Kenya team, on expedition for The North Face, assesses new route potential on Ololokwe, a remote wall in northern Kenya. We launched our expedition during the holidays this year, aiming to tackle big walls in northern Kenya, and climb long technical routes on the second tallest mountain in Africa, Mt. Kenya. 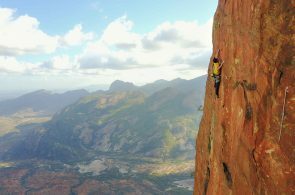 Alex Honnold quests out on the 2,000-foot tall face of Mt. Poi in northern Kenya. 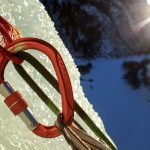 The climb, which has over twenty pitches in the 5.12 range and a few mid 5.13s, had only seen one previous ascent almost fifteen years ago by a team of Slovenians, who laid siege to the wall with big wall and aid-climbing tactics. 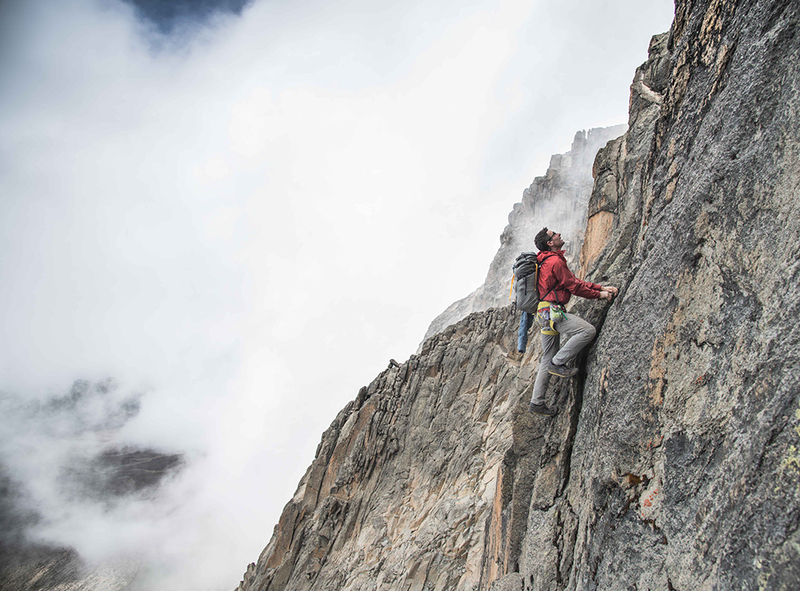 Maury Birdwell supported Honnold on his one-day ascent, a day that finished with an epic descent. They hiked off the wrong side of the mountain in the dark, but were thankfully rescued by a Samburu cattle herder who hiked them back up the mountain and showed them down the other side. 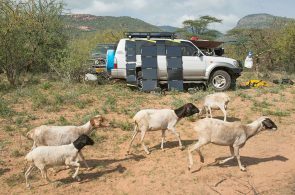 Our little media expedition in northern Kenya has been entirely reliant upon Goal Zero kit, to charge camera batteries, laptops, drones, bolting drill batteries and more. 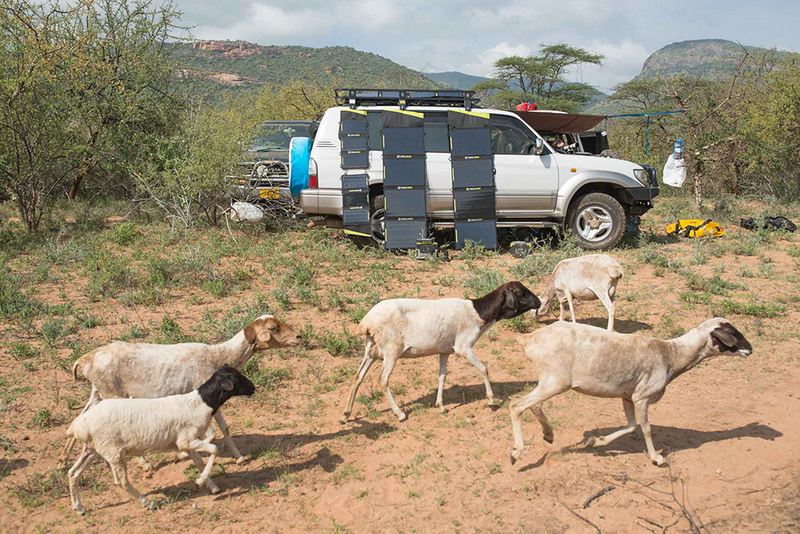 While useful to us, there is a need for solar energy in this part of the world and The Honnold Foundation, led by Alex Honnold, Maury Birdwell and Ted Hesser, organized a hand-off of the donated products to anti-poaching rangers stationed at the Ol Ari Nyiro Conservancy, the largest private land conservancy in Kenya. 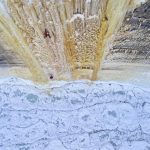 The rangers’ objective, to defend 90,000 acres of wild landscape from increasingly militarized poaching activity and wide-spread illegal cattle grazing that damages the ecosystem, is a nearly Sisyphean task. With these new systems, though, their ability to use lights at night, to charge radios for better tactical coordination, and to power infrared goggles and drone batteries for reconnaissance missions will all give them a leg up in the challenging missions that they face every day. Mt. 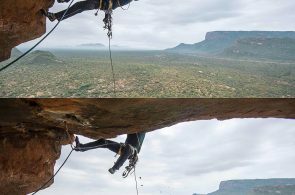 Poi was our primary objective for the trip: an 2,000-plus foot big wall in a remote part of northern Kenya that has seen only a handful of ascents, all via multi-day aid climbing missions. 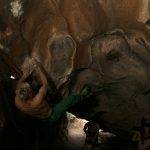 Our goal was to be the first team to free climb the routes in a day. Todd Skinner and Paul Piana put up routes here in 1999, followed by a Slovenian team in 2002. Only a few teams have visited since. 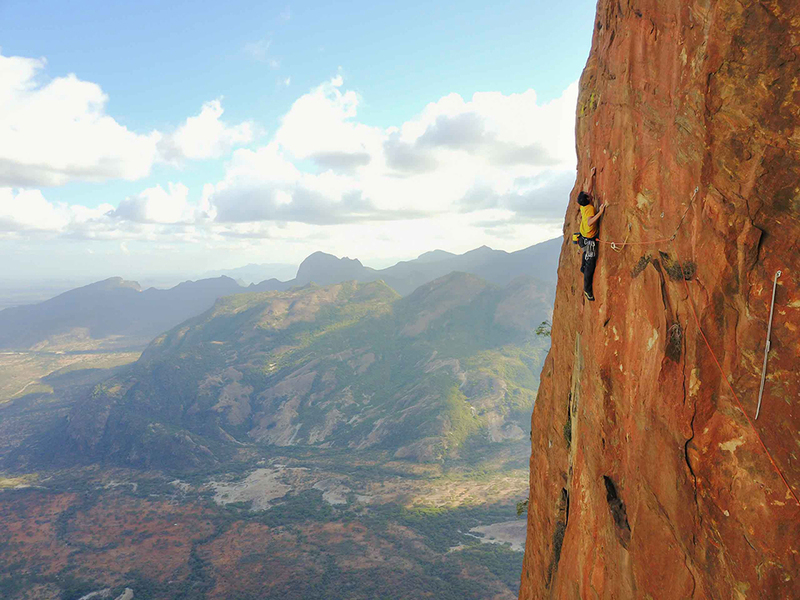 Alex Honnold and Cedar Wright quickly ticked off the Skinner route on our first day of climbing. 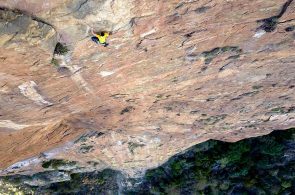 After a rest day, Maury Birdwell and Alex Honnold then dispatched with the Slovenian route. 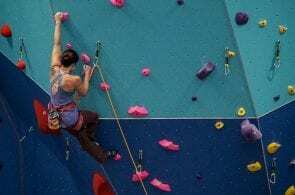 An anchor bolt disintegrated towards the top of the route, while Maury Birdwell was ascending in support mode, which forced the team to transition to the Skinner route’s final pitches to top-out. 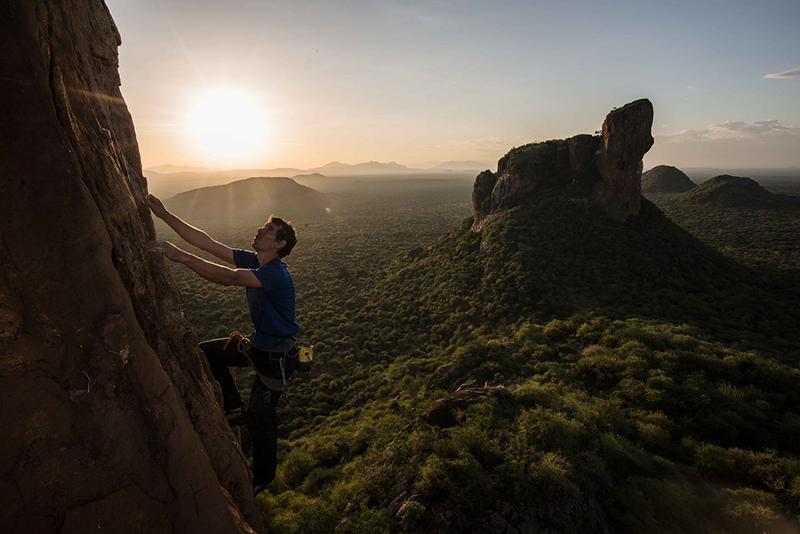 Alex Honnold scouts and cleans a new line on the Mouse Formation in northern Kenya. 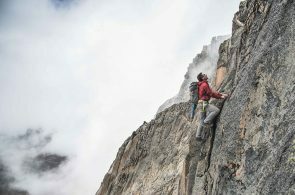 It took him two days of work to establish a steep and techy, 60-meter pitch of solid 5.12 climbing on the arête. We only brought 50 bolts to Kenya. Cedar Wright and Maury Birdwell used around 35 on their ground-up ascent of Samboru Direct on the Cat Formation, but there were just enough bolts for Honnold to finish his route, which he sent on his first go. 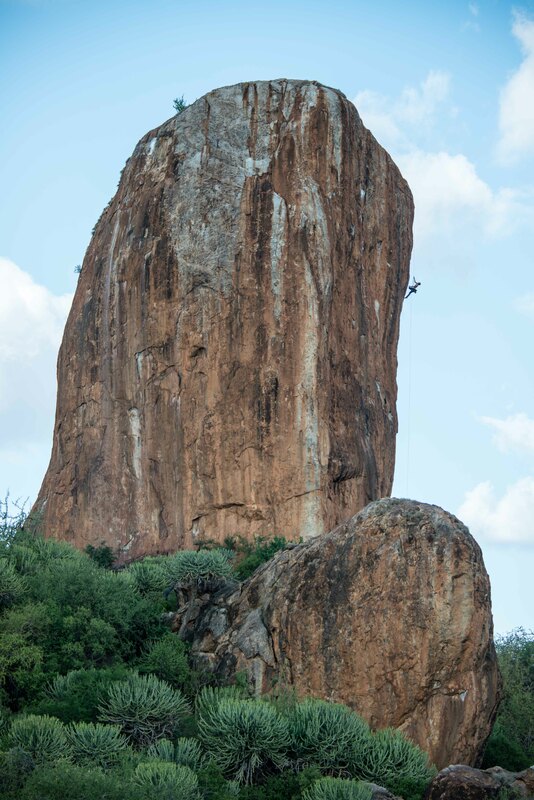 Mouse Formation is accessible for local Kenyan climbers, and, we hope, with some time and effort, the formation will develop into a proper sport climbing crag. 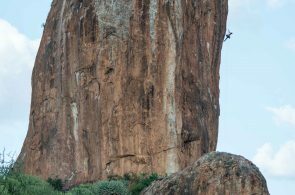 In the early morning light before the heat of the day, Alex Honnold flashes his new 5.12 on the Mouse Formation in northern Kenya. The route does not yet have a name. What do you think the route should be called? With a short and dynamic weather window, we decided to climb Mt. Kenya’s standard route as fast and light as we could. 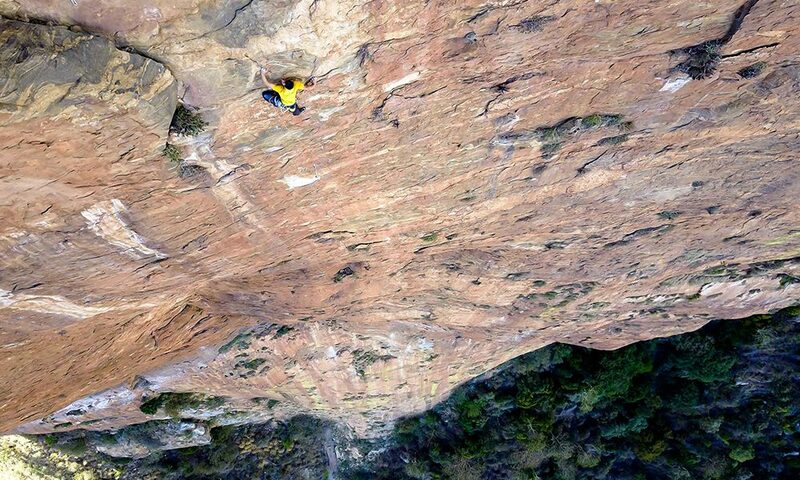 To do this, Alex Honnold, Cedar Wright and Maury Birdwell soloed up and down the entire route in their approach shoes with only a few extra layers in their backpacks. Cedar also brought along his light-weight paragliding kit, but the steep and narrow launch zone on top of Nelion looked heinous. The altitude zapped all of us. Alex threw up four or so times during the day. We all bonked on the way down. Mt. Kenya is no joke! Cedar Wright looking calm, cool and collected as he solo’s the standard route up Mt. Kenya in his tennies. The swirling, freezing mist made for interesting conditions during the speed ascent. 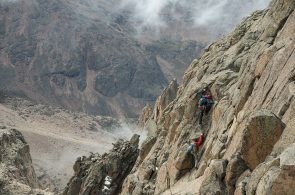 With pounding headaches, and visible altitude symptoms, the team down-climbed the entire mountain from Batian, through the Gates of the Mist, and down Nelion in about an hour. Perhaps a record? Parting shot: Basecamp below Mt. Kenya. Photos and captions by Ted Hesser / The North Face. 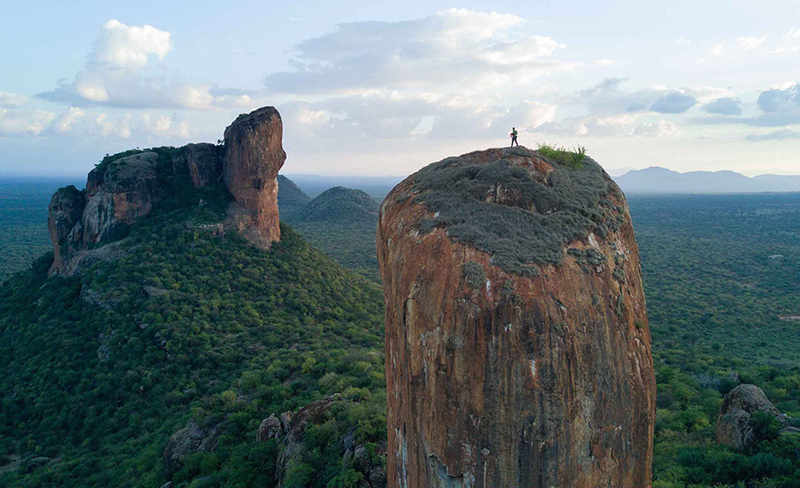 Alex Honnold, Cedar Wright and Maury Birdwell venture out on a “no holds barred” adventure to the wild and culturally-rich country of Kenya in a bid to climb its biggest wall, Mt. Poi, and tallest mountain, Mt. Kenya. On the expedition, supported by The North Face, they successfully climbed Mt. 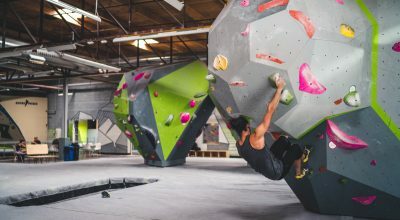 Poi—Honnold made two, in-a-day ascents—and Mt. 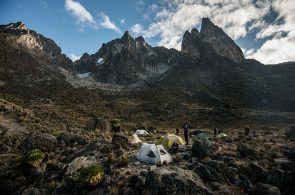 Kenya, and along the way, they established a few new routes on the Cat and Mouse formations, Honnold discovered the side effects of altitude sickness, and the team made lasting connections that will likely bring them back to Kenya one day.